It occurred to me recently that I haven’t updated this blog in some time. It isn’t because I haven’t been writing, but quite the reverse. So, what have I been up to? 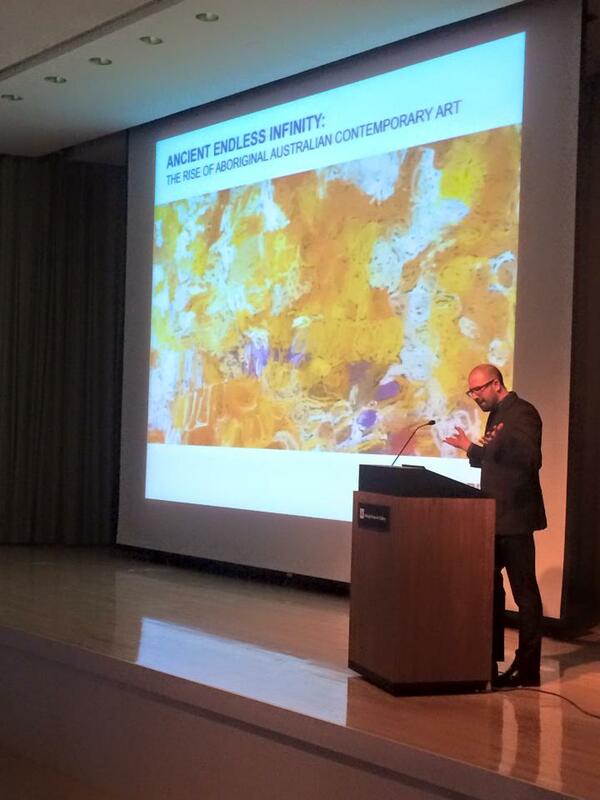 Well, last week I headed to Buffalo to give a talk at the Albright-Knox Museum, entitled “Ancient Endless Infinity: The Rise of Contemporary Aboriginal Australian Art.” It was magnificent to visit the Albright-Knox, and take in their extraordinary collection. As it happens many of their “masterpieces” were actually off on tour as part of the show Van Gogh to Rothko: Masterworks from the Albright-Knox Art Gallery… And while some might have found this disappointing, I found it really great to see such a varied selection of artists who are often underrepresented: Karel Appel, Joaquin Torres-García, Marisol, not to mention all those big Clifford Stills. It really shows the depth of this collection, that even without their “masterworks”, the collection still packed a pretty powerful punch. 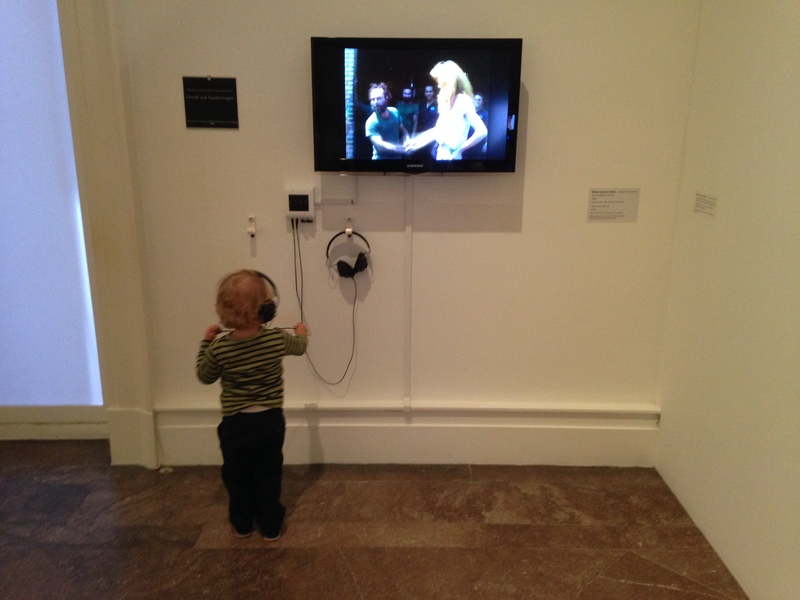 Gabriel appreciating Mierle Laderman Ukeles’ Touch Sanitation Performance 1977-80. But probably the biggest highlight for me, was to see the installation documenting Mierle Laderman Ukele’s Touch: Sanitation Performance. The work was a central part of Cathleen Chaffee’s really smart temporary exhibition Overtime: The Art of Work, which also included the quite compelling Harun Farocki video piece Workers Leaving the Factory. Alongside Chaffee’s exhibition was an equally well considered collection show by Holly Hughes titled Eye to Eye: Looking Beyond Likeness, which adroitly managed to offset 19th century portraiture from the collection with more recent efforts, ranging from a very awkward Warhol portrait of Seymour Knox, through to a profound and understated Felix Gonzalez-Torres paper piece. So, what did I talk about? Although I’ve lectured a fair bit on Aboriginal art, I’d never given a sweeping introduction like this one before, so it took a little bit of thinking about. I structured the talk into three sections: in the first, I tried to establish some of the key concepts for understanding Aboriginal culture: concepts such as Country, Law, Dreaming and so on. Then, I made my case that, rather than seeming arcane, such concepts gave Aboriginal artists a unique position from which to engage with the contemporary world. In the second section, I attempted to sketch a very brief history of Aboriginal contemporary art, starting with the artists who painted for Baldwin Spencer in 1911, moving through the great Yolngu renaissance led by Wonnggu Mununggurr, then I quickly moved through Papunya Tula, the diaspora of desert painting, the rise of urban artists around Boomali, and the emergence of the East Kimberley school. Finally, I tried to do a quick scan of recent developments, looking first at some of the stars: Paddy Bedford, John Mawurndjul, Gulumbu Yunupingu, Richard Bell, and then some more recent artists carrying the torch: Nyapanyapa Yununpingu, Bob Gibson, and Johnny Yungut Tjupurrula. Forty-five minutes is hardly enough to cover the entire history of Aboriginal art, but it was an interesting exercise, and one that I feel like I will probably spend the next couple of decades refining. 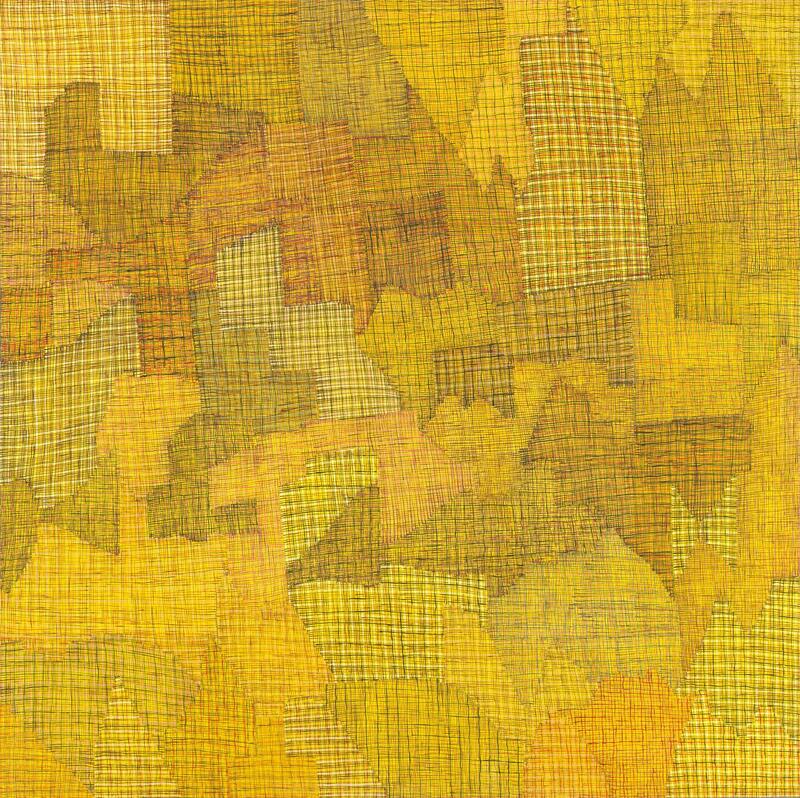 Nyilyari Tjapangati, Untitled 2010, acrylic on linen, 61 x 55 cm. In terms of writing, I have been pretty busy too. 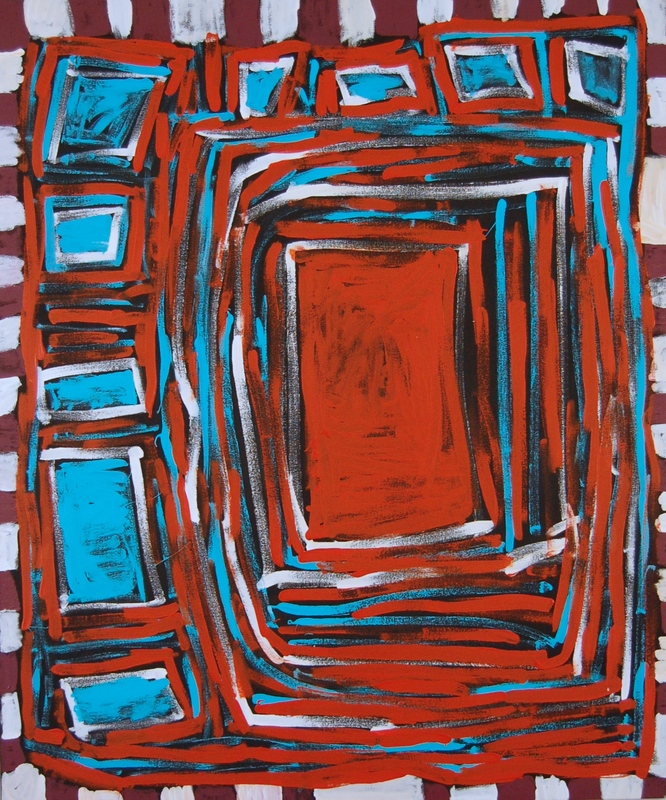 I recently wrote an long-ish essay on the Papunya Tula artist Nyilyari Tjapangati for a solo exhibition of his work in Paris at Stephané Jacob’s Gallerie Arts de Australie. The essay was published in a very lovely publication, richly illustrated with works by Nyilyari as well as some spectacular photographs by Paul Sweeney and Ben Danks. You can download a PDF of the catalogue here, or you can purchase a hard copy here. I have also recently finished writing a piece for the catalogue of the momentous looking exhibition Everywhen: The Eternal Present in Indigenous Art from Australia curated by Stephen Gilchrist for the new Harvard Art Museum. The works that Stephen has selected are truly extraordinary: it is a great credit to him that he has been able to secure such amazing loans from Australia’s premier institutions. I can’t wait to see the work assembled in Cambridge in February: and let me tell you, they would have to be pretty remarkable to convince me to go to Massachusetts at that time of year! The essay I wrote for the catalogue is called “A Stitch in Time: How Aboriginal Australian Artists are Reweaving Our World.” It gave me me the opportunity to delve into the work of an artist I have long admired: Regina Pilawuk Wilson. Regina was kind enough to give me an interview for the piece. She is such an impressive woman and she really helped set straight my thoughts. Regina Pilawuk Wilson, Syaw (Fish Net) 2008, synthetic polymer paint on canvas, 198 x 200 cm, National Gallery of Victoria. 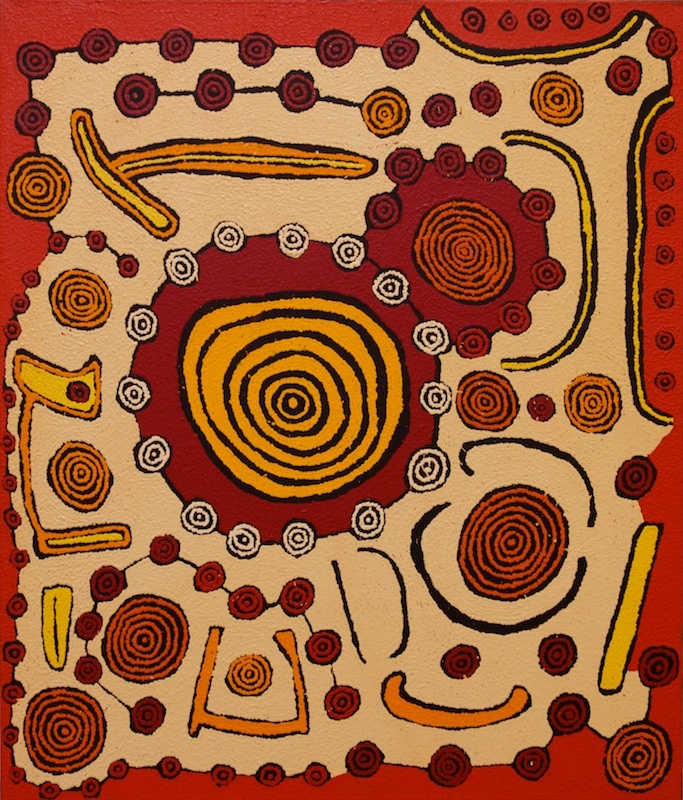 Bob Gibson, Warlurtu 2014, acrylic on-Canvas 100x121cm. I’ve also written a few recent things for Art Guide Australia. The first is an “Art Radar”: a pretty general wrap up of the state of the industry that I actually wrote shortly after returning from Australia in September 2014 but which just took a bit of time to make it to press. A few people picked me up on my suggestion that figurative elements are making a comeback in contemporary Aboriginal painting. Broadly speaking, I think this claim is correct, but it might take a bit of time to establish whether or not it is enough to constitute a “trend.” So, at this point it remains something of a speculation. But once you think about it, you start to see a lot more footprints, animal tracks, snakes, spears, woomera and shields turning up in recent paintings than we have seen in many years. But even more notable, I think, is the resurgence of the classic track-and-circle iconography. Johnny Yungut is a prominent example, but he is not alone. Scanning the website of Papunya Tula, you can see a plethora of magnificent recent examples of the style by Willy Tjungarrayi, Hillary Tjapangati, Morris Gibson, Yakari Napaltjarri and so on. I think this is mirrored in other communities, particularly in the NPY lands (think of people like Jimmy and Maringka Baker) but also in the work of artists like Peter Mungkari and Alec Baker. 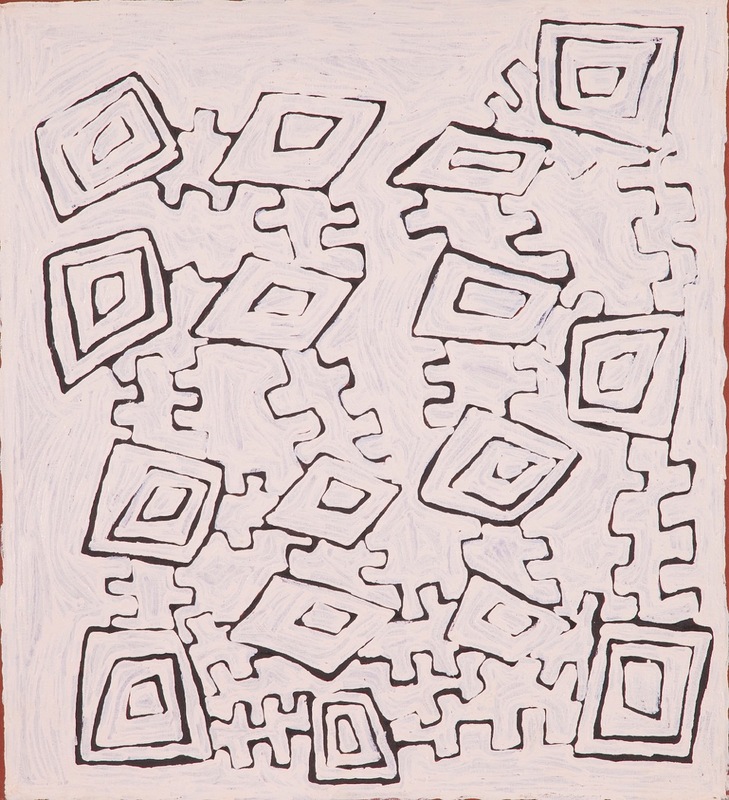 Morris Gibson, Untitled 2013, acrylic on linen, 107 x 91 cm. The other thing I wrote recently was a short preview of the exhibition Earth and Sky on display at the TarraWarra Museum of Art. I must admit, it was strongly influenced by reading Will Stubbs punchy essay in the exhibition’s catalogue. Will’s take-no-prisoner’s style of writing is quite infectious… I am not entirely sure why I started moving into boxing metaphors at the end, but I think I will just blame Will! I have also written a short piece for a forthcoming show at JGM Gallery in London, to accompany their May exhibition Transformations: Aboriginal Art Today. Finally, the other thing I have been doing is slowly adding bits and pieces to my academia.edu page. So, if you are really interested, you can find a selection of more recent writings there too! Comments Off on What have I been doing?